Sathyan Anthikkad is a Malayali Indian film director known primarily for his family based mainstream movies. He has created many hits, especially when working with Sreenivasan as the scriptwriter. His popular films include T.P. Balagopalan M.A. (1986), Sanmanassullavarkku Samadhanam (1986), Nadodikkattu (1987), Thalayanamanthram (1990), Sandesham (1991), and Veendum Chila Veettukaryangal (1999). Sathyan was born in 1954 January 3 in Anthikkad, Thrissur, Kerala. He was born to M.V. Krishnan and M.K. Kalyani. Though he was successful as a lyricist, his wish was to become a director. 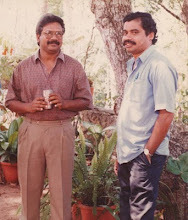 To fulfil that, he became the Assistant director to Dr. Balakrishnan. Sathyan kickstarted his film direction with Kurukkante Kalyanam in 1982 and there was no turning back. He teamed-up with Sreenivasan and made some of the most memorable films in Malayalam film history, with Sreenivasan as the screenwriter. Thalayanamanthram, Nadodikkattu and Sandesam are some of the films born from the team, with socially relevant matters in a comic touch. Sathyan made two novels into films:Appunni starring Superstar Mohanlal which was a film adaptation of V. K. N.'s novel and Irattakkuttikalude Achan starring Jayaram and Manju Warrier, which was an adaptation of C. V. Balakrishnan's novel. Off late, he has ventured into screenwriting also and made films like Rasathanthram and Vinodayathara with credits of story, dialogues, screenplay. He is a pet of family filmgoers because of his selection of plots in family-life background having social relevance and because of his comedic tastes. He has often made maestro Ilayaraja to set scores for his films. They teamed-up in films like Achuvinte Amma, Rasathanthram and Vinodayathara, and many of the tracks from the albums were chart busters. Dear Sathyan Sir, Actor Rehman is very suitable in your films, why don't you cast rehman in your films now a days?. This padmarajan lad looks very handsome, good acting as wel as good screen presence. We humbly request you bring him back in your fothcoming films. He is still in the heart of malayalee families. Kindly accept our request. I am mohana...... mother of a 4 year old girl. Even the dialoges in your movie kadha thudarunnu is the same happend in my life. You concluded the cinema with lot of hope and expectations..
You succeded to give confident to me to complete my studies. I thank you every much for the power and possitive energy created in my mind to go ahead and to complete my professional course. Thank you once again .....and if I reach the level where you concluded, I will definitely come and meet you.